Description: This collaboration with Resist the Raids Boston was created in solidarity with immigrants everywhere, and especially here in Boston where immigrants and those who stand with them are organizing against deportations and mistreatment. 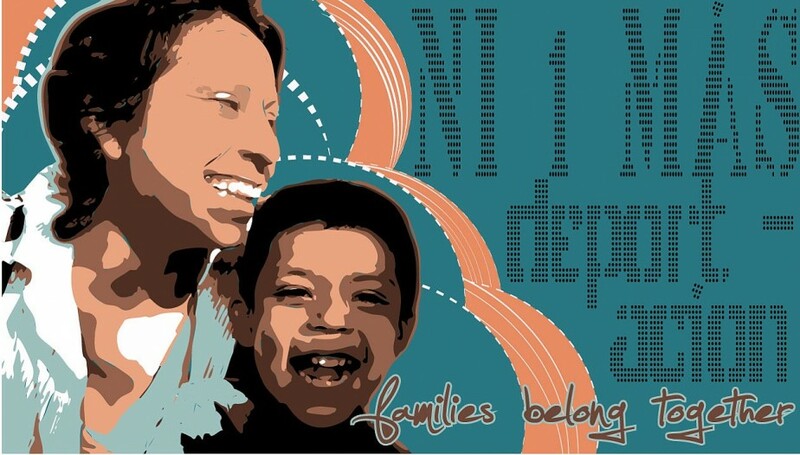 This banner features a beautiful hardworking mother, Mariola, and her son Ernesto. When Mariola faced deportation, the community responded and demanded ICE grant her a stay of removal. After a press conference and just three dedicated days of hard work and organizing, Mariola’s stay of removal was granted. The people united will never be divided! // ¡El pueblo unido jamás será vencido!